Earlier 19th century, altered. 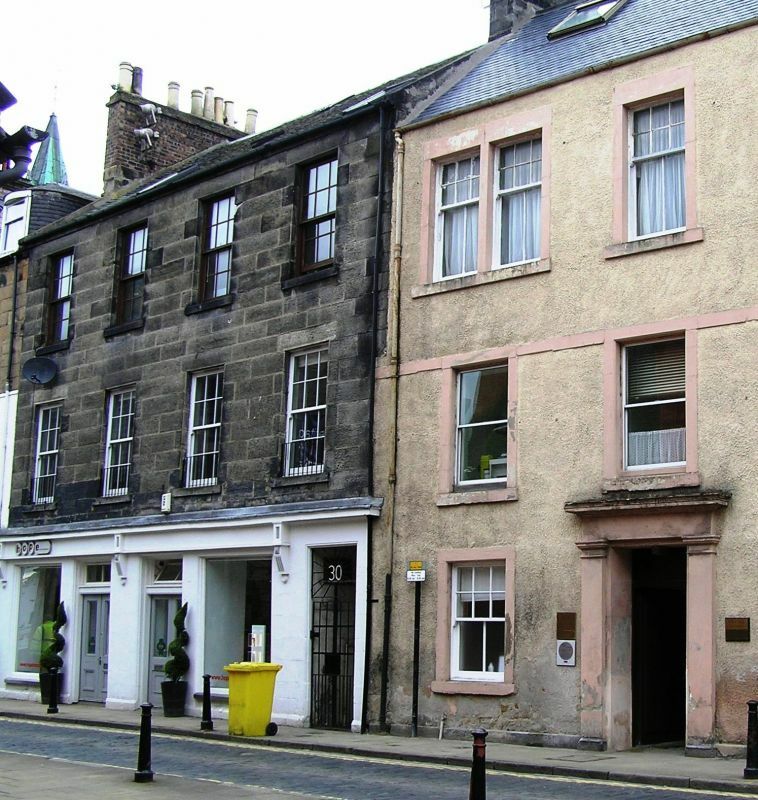 3-storey; 4-bay; terraced tenement block with ground floor shopfront. Coursed, dressed, droved sandstone (painted to ground floor) with droved ashlar dressings to principal (S) elevation; harled to rear. Base course; eaves band to principal elevation; roll-moulded openings to ground floor. S (PRINCIPAL) ELEVATION: pair of entrances to centre of ground floor shopfront (probably 2 shops originally); both with 2-leaf panelled timber doors with glazed upper panels and 2-light rectangular fanlights. Flanking shop windows. Entrance to vennel to outer right. Late 20th century bracketed timber fascia to shopfront. Regular fenestration with window to each bay to upper floors. N ELEVATION: semicircular-plan stairtower to centre. Additions to right. 12-pane timber sash and case windows to upper floors of principal elevation; single fixed frames to ground floor shopfront. Grey slate roof. Flanking ridge stacks; that to W brick with band course; that to E coursed sandstone with moulded cornice; round cans. Does not appear to exist on Wood's plan. A reasonably intact late Georgian street frontage with alterations to ground floor.